We are now in the process of applying the final design touches to our newest groovy 3-column Joomla template – Feel the Music, which is planned to rock your browsers very soon Our designers have poured a full cup of their creative juices into the design of this eye-candy template infused with funky music mood and dance spirit. A perfect design skin for your personal music page, music portal or even a radio station! The free music Feel the Music Joomla template will be offered in four color skins – red (default), blue, orange and green, so that you could better tune your website design to the music style you are a fan of. In addition, the template will come with a customize-banner option, allowing you to choose between 5 catchy music-focused banners, one of them even featuring Christmas decoration elements! The banner area will support the Newsflash1 module, giving you the chance to post any music event highlights in the most visible part of the template. As a tradition in creating our newest line of advanced Joomla templates, we have added two pre-defined sections (USER 1 and USER 2) to the bottom area of the template, which you could use for posting Latest News, Archive, Polls, etc. 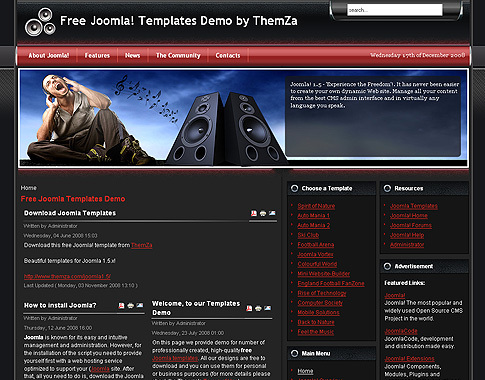 ‘Feel the Music’ will be released for free download in the Joomla 1.5.x Templates section of the Themza website within a couple of days. Don’t miss the chance to make your Joomla website rock! This entry was posted on Thursday, December 18th, 2008 at 11:57 am	and is filed under Joomla 1.5.x. You can follow any responses to this entry through the RSS 2.0 feed. You can leave a response, or trackback from your own site.